Were there a lot of people walking into a Nissan showroom saying they liked the Juke NISMO but wanted it to have more power? I don't know, but Nissan thinks it couldn't hurt to make a faster Juke, which is why they're showing the NISMO Juke RS next month at the Los Angeles Auto Show. Sweet. All that we really know is that the people putting together the LA Auto Show are expecting a Juke RS NISMO and another unnamed NISMO concept, so Nissan had better show up with some cars to look at. 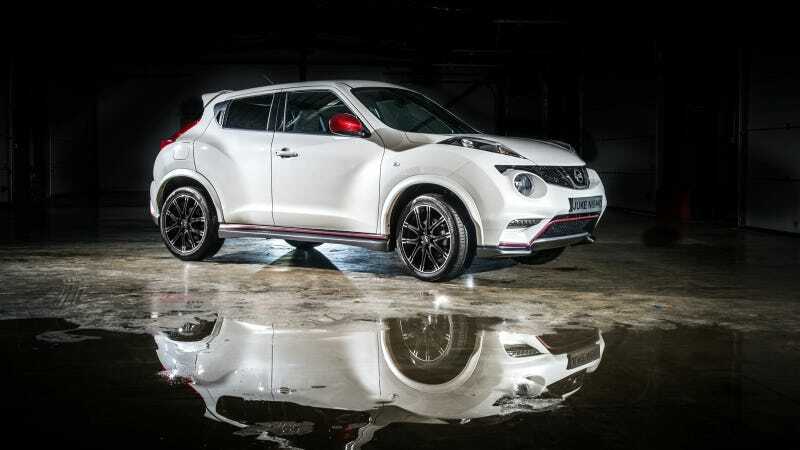 Whereas the standard Juke has a 1.6-liter turbo four with 188 horsepower, the Juke NISMO has a 1.6-liter turbo four with 197 horsepower and the insane Juke-R had a 545 horsepower twin-turbo V6, the Juke RS NISMO will probably have horsepower in the low 200s from the 1.6 turbo. That should all be sorted out at the auto show, so watch this space for more on the Juke RS NISMO, if you're one of the people who likes a faster Juke.